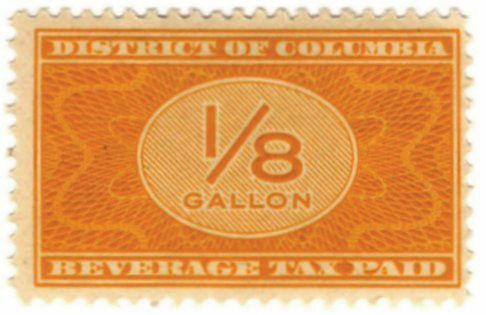 Beverage Taxes of long ago in Washington, D.C.
Not many years ago one of our philatelic specialty societies changed its name from the Bureau Issues Association (BIA) to the United States Stamp Society (USSS). This was a painful reminder that the Bureau of Engraving and Printing, which had started to print our nation’s postage stamps in 1894 no longer was printing postage stamps. The Bureau had an even longer history of printing at least some and eventually all of our nation’s revenue stamps. 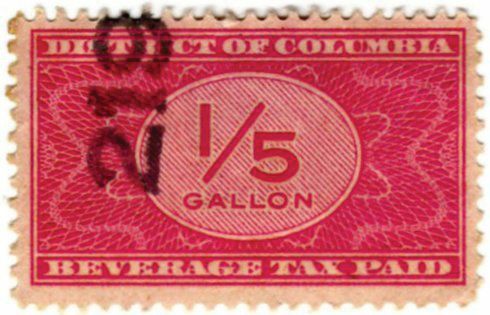 The first U.S. beer stamps of 1866 were printed by the Bureau; by 1878, all the tobacco and alcohol tax paids were printed by the Bureau; and by October 1880, all the revenue stamps were being printed by the Bureau of Engraving and Printing. This all happened 14 years before the Bureau took on the printing of postage stamps! 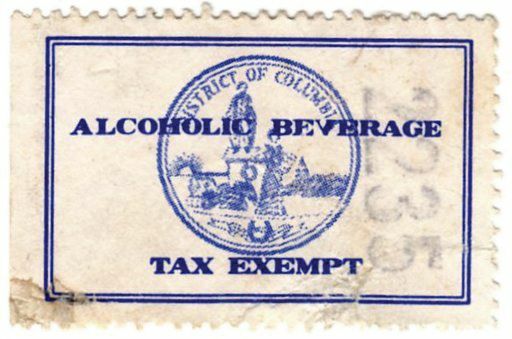 In 1934, the Bureau obtained the contract for printing of the alcoholic beverage tax stamps for the District of Columbia. The stamps themselves were printed from engraved plates, initially on flat plate presses and eventually rotary press plates were produced and used. The first plates were for the eight different denominations, 1/80, 1/20, 1/16, 1/10, 1/8, 1/5, 1/4, and 1 gallon. They were issued in four different colors: yellow for alcohol, orange red for spirits, purple for champagne, and green for wine. The fl at plates were 200 subjects and as was the practice for the commemorative postage stamps, they were separated by horizontal and vertical lines and arrows for separation into for 50 subject panes. As was the practice with postage stamps, they were perforated 11. I state this emphatically in spite of pioneer cataloger George Cabot’s (1940) listing with the perforation as 10 1/2 x 11. Catalogers since the time of Cabot, the State Revenue Society’s founder, E. S. A. Hubbard in his 1960 catalog and Scott Troutman’s 2007 catalog, have blindly followed the Cabot and Hubbard tradition of stating that the stamps are perforated 10 1/2 x 11. To the best of my knowledge, no horizontal format stamps printed by the Bureau were ever perforated 10 1/2 x 11! 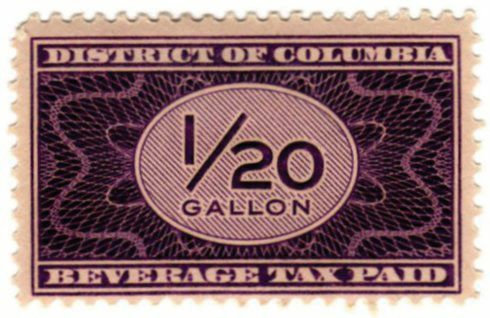 Several of these sizes were not federally permitted sizes for distilled spirits in 1934. Even though all these were printed in the orange red for distilled spirits, it seems likely that several denominations were not issued until later. 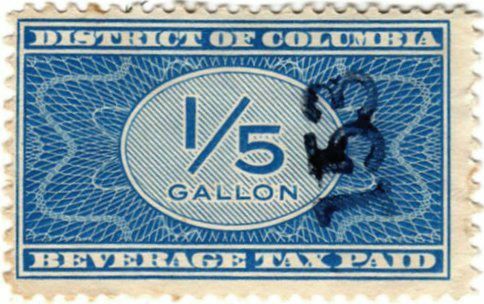 Southgate in 1937 reported that the tax rates were alcohol - $1.10 per gallon; spirits - 50¢ per gallon; champagne - 15¢ per gallon; and wine - 10¢ per gallon. 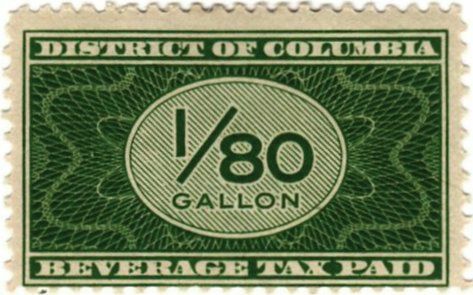 The history of rates from 1934 through 1962 when the stamps were discontinued is not known. However, it is known that at some time, a separate rate was added for light wines (less than 14% alcohol) and a series of stamps were issued in pink. There are a number of other changes during the nearly 30 years that these stamps were in use. The purple color was abandoned for champagne and sparkling wines and blue was substituted (Figure 4). Both SRS founder Bert Hubbard and the current Troutman catalog list the blue stamps under the distilled spirits category. But personal research at the Historical Research Center of the Bureau of engraving Printing shows that the blue stamps were intended for champagne. It is not known when this change took place. At some time during the 1950s rotary press plates were prepared and used for some of the stamps. Again it is not known whether all colors of stamps were printed on the rotary press. One final change took place, again presumably shortly before the stamps were discontinued. The change was a generic background design with the denomination added separately in black. This practice was initiated by the Bureau for the Series of 1941 wine stamps (which came into use in February 1942) and the cigar stamps in 1942; the first use for the post office was on the postage due stamps of 1959. This author has seen only the orange stamps for distilled spirits. 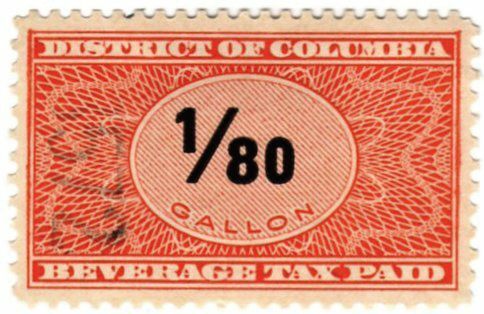 Perhaps the most desirable item among all the beverage stamps of the District of Columbia is a tax exempt label that was used for distilled spirits intended for use in foreign embassies. This was almost certainly not printed by the Bureau of Engraving and Printing and it is not known druing what period of time this label saw use. It seems likely that this stamp was probably used for all categories of alcoholic beverages. If it seems like there is much still to learn about these revenues from our nation’s capital, you are right. We will have to wait until further research is conducted in the D.C. laws and if the printing records can be found.